Documentation and SupportReleases Feijoa Release Notes 2018.02.17When Creating a "From Table" Import Data Process, Users May Now Select the Fixed View to Import From. 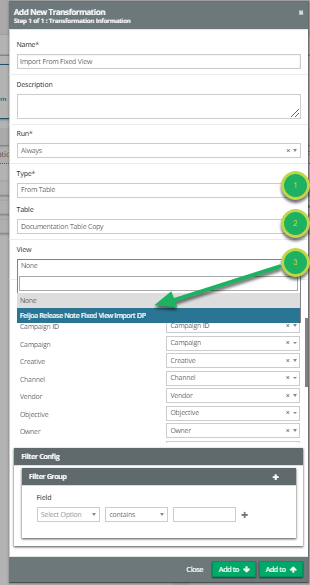 New in the Feijoa Release: When creating a Data Process that includes a From Table Import, users may now choose which Fixed View will be used during the Import. This opens up a whole new level of automation for users. Multiple Tables can now be scheduled to import data from different Fixed Views of the same Table. When creating a new Data Process, click the plus (+) button to add a Transformation. Fill out the information in the "Add New Transformation" modal. Type: Choose FromTable as the Transformation Type. Table: Choose the Table that the Fixed View was saved from. View: From the drop down, choose the Fixed View that should be used when importing the data. That's all that there is to it!